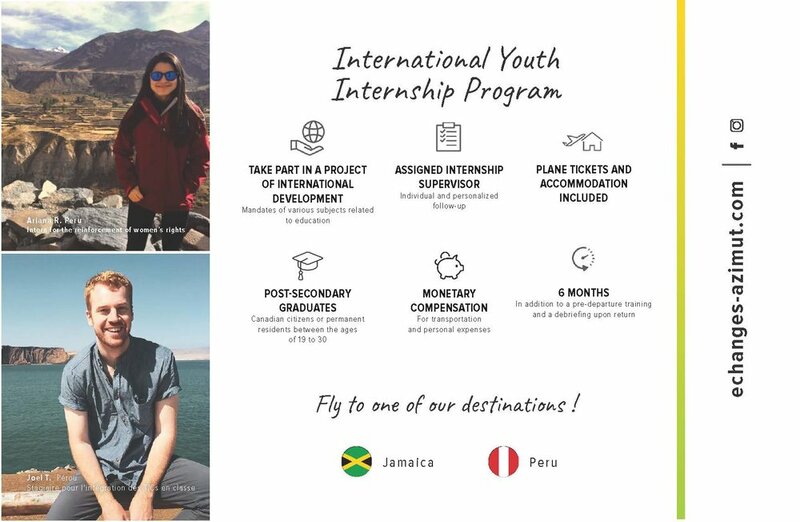 Carry out a 6-month internship assignment in Peru or Jamaica to gain experience in international development while experiencing a professional and cultural language immersion! The mission of Women Development Centre (WDC) is to facilitate and encourage an environment for victimized women and children, persons with special needs, youth and other vulnerable groups to achieve positive changes in their lives by resolving or minimizing their problems through active participation in decision making within the socio-economic process. Sthree, meaning ‘Women’ in both Sinhala and Tamil languages, has been established as a not-for-profit social enterprise. This commercial space allows women entrepreneurs/producers to showcase and sell their handicraft products such as eco-friendly purses, batiks, home décor items, artwork, silk scarves and shawls etc. They also sell beautiful wood furniture handcrafted by people with disabilities. In order to increase market share and success, Sthree aims to increase the visibility among tourists and develop partnerships with the local tourism sector including hotels and tour operators to provide unique high-quality souvenirs. Sthree’s success will ensure sustainability for itself, support WDC’s broader mandate and continue to support some of the most vulnerable people in the region. In addition to the shop, a new venture has been established as Shtree café with the support of the Planaterra (Canadian org) in the same premises. At the moment it caters to adventure tour groups and it will be open to the general public in the near future. WDC seeks a volunteer Digital Marketing Advisor to provide guidance on Digital Marketing Campaigns. TYPE OF ASSIGNMENT: Volunteer Cooperant (VC/OS). Unaccompanied assignment - This assignment does not include support for accompanying partners or dependants. MCC’s Ottawa Office Student Seminar, happening February 14-16, 2019 in Ottawa, ON. This is a great opportunity for students to further their education, and there is possibility for travel subsidies for Maritime students. The application deadline for the seminar is January 18th. The link to the website is here. Serving and Learning Together (SALT) is a year-long, cross-cultural service experience. Through SALT, Christian young adults from Canada and the U.S. serve internationally in a wide variety of positions in fields such as education, agriculture, healthcare, information technology, peace and more! During their assignments SALTers are immersed in another culture, living with host families or in communal settings such as dormitories or teacher housing in Africa, Asia, Europe, Latin America and the Middle East. SALT is an 11 month program, beginning in August and finishing in July each year. Positions are posted in November and applications are accepted until February 15. Seed is a two-year program that brings together a cohort of young adults ages 20-30 from around the world to learn, serve and reflect. Within their regional group, each See participant has an assignment where they live in a local community, serving with MCC partners or churches that work from the grassroots to address issues such as violence, oppression, food insecurity, access to education, climate change and environmental destruction. We have Seed programs in Bolivia, Colombia, Southern Africa, Africa’s Great Lakes region and Central America. Over two years, Seed participants reflect individually and as a group on a range of topics, looking at how national and international issues affect the communities they are serving in. Participation in Seed as a married couple without children is possible. MCC has three advocacy offices – in Ottawa, ON with the Canadian Parliament, in Washington, D.C. for the U.S. Congress and Senate, and in New York City, NY for the United Nations. Two of these offices offer seminars for university students each year, on topics such as Indigenous rights, social justice or faith and public policy. They are an opportunity to hear from current political leaders, discuss how our faith can be involved with advocacy, and network with other students. The seminar is two and a half days, typically runs from Thursday morning to noon on Saturday in mid-February. Dates are set each year, and there are a limited number of spaces available in the seminar. MCC Manitoba offers a limited number of travel bursaries. The Ottawa office coordinates a group booking at a local hostel for accommodation (at the students’ expense). The seminar is two and a half days, typical runs from Thursday morning to noon on Saturday at the end of October. Dates are set each year, and there are a limited number of spaces available in the seminar. The UN office coordinates a group booking at a local hostel for accommodation (at the students’ expense). The Ottawa office offers two internships per year, one from September to December and a second one from January to April. The Advocacy Research Intern is part of a team that provides expertise and assistance for MCC Canada’s advocacy efforts. This position is based in the Ottawa Office, which serves as a conduit of information and bridge for relationships between the federal government of Canada and MCC Canada’s diverse constituency. It witnesses to government on issues of peace, justice and human dignity that arise out of MCC’s ministry at home and around the world. The Ottawa Office works with a number of coalitions while trying to bring a unique, Anabaptist perspective to the work of political engagement. This unpaid position is supervised by one Ottawa Office staff person but requires close and ongoing collaboration with other members of the Ottawa Office team. The MCC Ottawa Office will make a modest contribution towards the intern's transportation expenses. The internships are posted a few months before they begin, in the list of open MCC positions at mcccanada.ca/get-involved/serve/openings. This is a one year internship, beginning in September and finishing at the end of August. The work of the MVS intern will vary largely on what skills the applicant brings to the office, and which skills are most useful to our mission. The intern will attend NGO working group meetings, take minutes, contribute ideas when applicable, and may serve as a coordinator of an NGO working group. The intern will likely be tasked with administrating the web and social media presence of the office and any working groups s/he is a part of. A large portion of the work the intern will complete will be learning about the methods of the UN organs, keeping up on specific world news, helping to plan the annual student seminar, and doing longer research-based projects. Interns serving through MVS will receive free housing at Menno House, as well as modest stipends for food, transportation, and personal spending each month. A college graduate wishing to serve in this internship will apply though Mennonite Mission Network’s MVS program. MVS is a nationwide service program with about 10 service placement options, one of which being Manhattan, New York. Applicants will apply through MVS, choose Manhattan as their desired service location, and select the MCC UN Office Internship as their desired placement. This is a one-month internship, from approximately mid-July to mid-August. The work of the summer intern will vary largely on what skills the applicant brings to the office and which skills are most useful to its mission and mandate. Generally, this opportunity involves a short-term research project determined by both the interest of the student as well as the needs of the office. The internship is posted a few months before it begins, in the list of open MCC positions at mcccanada.ca/get-involved/serve/openings. MCC offers international learning tours at various times of the year to visit and learn about MCC’s work in one of the 50+ countries where MCC works. These are great opportunities to learn how MCC partners with local churches and organizations serve the needs of communities and people, to learn about the local context and explore questions of Christian faith and life. Learning tours are typically 10-14 days and costs vary depending on the region of travel. Contact your local MCC office to learn about upcoming learning tours. Chalice is launch their next Solidarity Tour to Paraguay for this coming March. Mission dates are March 2-16 and the team will be visiting one of Chalice’s Sponsor Sites in Villeta. Their partners, the Daughters of Mary Help of Christians, have been engaged community social work in this community since 1964. Chalice has been working with them since 2012. They are primarily recruiting volunteers who have a heart for service. They are also interested in volunteers who have experience in the following areas: information technology, photography, finance and savings, wood and leather handicrafts, public health, family/child psychology and counselling, social work, teaching mathematics, painting and other artistic skills, and in coordinating events for children. You will find all details in the document HERE. Application are due October 8. Please contact Joanne (joannealbrecht@chalice.ca, 1-800-776-6855) if you have any questions. Are you a young person between the ages of 19-30 looking to get real work experience in your field while making a positive impact on the world? Innovate ME provides career coaching and training to young people through dynamic overseas internship placements! As a Canadian youth intern, you will have the opportunity to work with our excellent overseas partners to advance girls education and literacy, youth livelihoods and wildlife conservation. Click here to see job postings and apply. Not graduating yet? Check back for future opportunities. We will be posting new positions until 2021. Looking for an opportunity of a lifetime? Volunteer with Uniterra! Uniterra contributes to improving the socio-economic conditions of poor and marginalized communities in 14 countries and with over 200 partners in Africa, Asia and the Americas through the exchange of expertise and knowledge of Canadian and international volunteers. Uniterra believes that economic growth, when inclusive, is the most powerful driver of poverty reduction. The purpose of the Uniterra program is to improve the lives of some of the world’s most vulnerable populations by stimulating growth and facilitating access to the benefits of growing and diversified markets. To make this happen, we are working with our local partners to enhance the income of poor and marginalized women and youth through better access to employment and income generation opportunities. Uniterra country program staff work with our local partners to design Uniterra assignments in the context of the country strategy, supporting the inclusion of women and youth in key economic sub-sectors. Cuso International is a development organization that works to reduce poverty and inequality through the efforts of highly skilled volunteers, collaborative partnerships and compassionate donors. We envision a world where all people are able to realize their potential, develop their skills and participate fully in society. We believe in the power of people, value diversity and take responsibility for our actions and proactively demonstrate that we work with and on behalf of others. Cuso International works in developing countries across the world. We currently have programs in twenty countries. View current placements here. We are currently seeking key volunteer personnel with demonstrated leadership and communication skills, who are passionate about raising awareness of Global Poverty. As a member of this dynamic team, you will be working with the Fund Development Department to research funding opportunities and speak with potential donors. Have strong relationship building skills and love to inspire others. Have leadership skills combined with a compassionate heart. Have an aptitude for researching and analyzing information. If you possess the necessary qualifications, and have the desire to help people in need, we have a role for you! If you are someone who is interested in spending a morning or afternoon assisting seniors with transportation and errands such as grocery shopping, then please contact the Canadian Red Cross now! Volunteer drivers are needed for a new program that provides transportation services within HRM. If you are interested in learning more about this volunteer opportunity, please contact us at 902-424-1420 or send your resume to communityhelpns@redcross.ca, or visit our website at www.redcross.ca and submit a volunteer application today! See full details here. Community Help Service Centre Assistants needed too. See more details here. Uniterra is a leading Canadian international volunteer cooperation and development program, jointly implemented by the Centre for International Studies and Cooperation (CECI) and World University Service of Canada (WUSC). Uniterra contributes to improving the socio-economic conditions of poor and marginalized communities in 14 countries in Asia, Africa, Latin America and the Caribbean through the exchange of expertise and knowledge through Canadian volunteers. Visit http://Uniterra.ca to see current volunteer opportunities.